Huge jumble of sandy-colored granite rocks in a forest of Joshua trees, about two hours southwest of Vegas, just across the CA state line in the Mojave National Preserve. Sunrise Rock is just off Cima Road, in a paved turnout…so no high clearance/4WD is necessary. A veteran’s group placed a huge cross monument at the top of Sunrise Rock back in the 1930s, and over the years the cross has been taken down and re-erected by people on either side of the Church v. State issue (the monument is on nationally administered land, thus the conflict). The area is very remote, and the chance of being harassed is low. 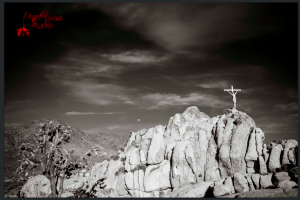 Other than the rocks and the cross, other shooting options in the area include a very few SUPER-busted up wooden structures along Cima Road, and a fairly dense Joshua tree forest. But if inclined, you could also stop at the Jean dry lake bed, just off I-15 on the way to/from Vegas to this location. It is very nice to see a pretty lady that has not “fixed” her body by use of silicone. It has become hard to find natural beauty but in you I have found it. Thanks for sharing. I love that beautiful cross.Thanks for your photos and videos.